Sometimes, it's not where you started, but where you ended up. That's certainly the case for Malbec, and as we celebrate World Malbec Day (April 17th), we have chosen to feature three different Malbecs that we carry, and a great Cabernet Franc all from Argentina's most prominent growing region, Mendoza. Malbec was first grown in Sud-Ouest (southwest) France, and found its most prominent French home in Cahors, on a small river that flows back towards Bordeaux, some 233 kilometers away. Also known as Côt, Malbec was used as a blending grape in Bordeaux, but thanks to phylloxera and its low resistance to weather changes, Malbec didn't catch on to the point that Cabernet Sauvignon, Cabernet Franc, and Merlot did. It all started in Argentina when the governor of Mendoza, Domingo Faustino Sarmiento, hired French agronomist Miguel Pouget to bring vine cuttings from France, including Malbec. The high altitude of Mendoza proved very suitable to Malbec, and 'la uva francesa' (the French grape) took off across the Latin American continent. With its soft tannins and ripe fruit, Malbec was immensely popular, but in the mid 60s, Argentina was under tremendous social, political, and economic turmoil, and inflation made wine-makers start focusing on high yield grapes to meet the mass market, and winemakers across Argentina were encouraged to pull up their Malbec vineyards in favor of Cereza and Criolla Grande, varietals so forgettable that you probably already forgot what they were called before I finished this sentence. We toss this term around quite a bit, but Mendoza is no small place, it's a province in Argentina, on the border with Chile that makes up some 148,827 km2, with the Andes providing the natural land border to the east. The continental weather is mild and dry, with a wide thermal amplitude between day and night; in Mendoza there are 300 sunny days a year. Due to the lack of rain (180mm average a year), the inhabitants of the area have been forced to use an irrigation system that dates back from pre-Colombian times to water the crops. The snow accumulated in the Andes mountains during the winter starts to melt in spring. This water, which is of exceptional purity, is conducted through an intricate system of ditches and canals of different sizes to every corner of the province to irrigate vines and other crops. Water shortage, while once was an obstacle has become an advantage because our plants only get water when necessary, and with a frequency optimal for grape development. It seems counterintuitive, but the poor soil and dry climate force grapes to produce exceptional fruit, because a constant supply of rich organic material makes the grape vines lazy, and the fruit uninspiring. Fighting for existence seems to bring out the best. The producers we are focusing on this week are all children of Italian immigrants, and all are right on top of Luján de Cuyo, an area known both for its Malbec and its alluvial soils (alluvial refers to the presence of stone and sandy surface soils over clay substrata). The Mosso Winery is currently based in Lunlunta, but the family began the journey from Turin, Italy in 1860, when Francesco Mosso led a Piedmontese colony to the town of Santa Fe, Argentina. They worked the land almost immediately in nearby vineyards, but by 1900 the family had resettled in Mendoza, and started producing a Turin-style vermouth in Chacras de Coria, a town located northwest of Luján de Cuyo. But in 1909, Juan Bautista Mosso and Antonio Mosso finally built their own winery in Luján de Cuyo. The winery stayed in business for 82 years, producing Malbec until austerity drove the company to bankruptcy in 1991. In 2002, the great-grandchildren of Juan Bautista and Antonio, Ernesto Mosso and Pablo Mosso restarted the winery. We're excited to both have the Finca Mosso, and Famiglia Mosso from this fabulous boutique producer. Both of these wines are made with 100% Malbec. The Finca Mosso sees one month aging in third use American Oak barrels, while the Famiglia Mosso sees 8 months in oak, with 30% of the wine put in first use French Oak, and the remaining 70% is aged in second use American oak. "First, for red wines, controlled oxidation takes place during barrel aging. This very gradual oxidation results in decreased astringency and increased color and stability. It also evolves the fruit aromas to more complex ones. Through a program of topping the wine (filling up the barrel) while it is in the barrel and racking the wine from barrel to barrel to clarify it, just enough oxygen is introduced to the wine to have these beneficial effects over a period of many months. Second, oak wood is composed of several classes of complex chemical compounds, each of which contributes its own flavor or textural note to both red and white wines. The most familiar of these are vanilla flavors, sweet and toasty aromas, notes of tea and tobacco and an overall structural complexity of tannin that mingles with the tannin from the fruit itself (in the case of red wines). The specific compounds creating these delightful nuances in the finished wine are: volatile phenols containing vanillin; carbohydrate degradation products containing furfural, a component yielding a sweet and toasty aroma; “oak” lactones imparting a woody aroma; terpenes to provide “tea” and “tobacco” notes, and hydrolysable tannins which are important to the relative astringency or “mouth feel” of the wine." It's not just "je ne sais quoi", it's science. You'll see references to "new" and second and third use oak. This is connected to the "extract" (or chemical effect) of the oak. There is about 50% for first use, 25% for second use, and smaller percentages as the usage continues. 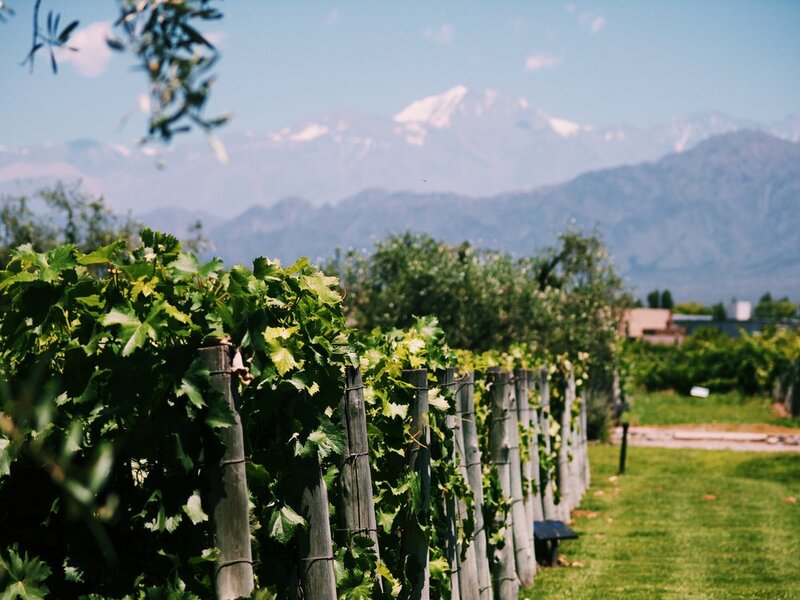 The Biagorria family has been making wine in the Mendoza region of Argentina since 1960, first with purchased vineyards, and then the eventual start of their own winery in 2004. Mi Terruño, or "my land" is the sibling duo of winemaker Maria Eugenia and communications director Gabriel. The winery itself is in San Roque, just outside of Luján de Cuyo, retrofitted from an old glass-tile factory. We're huge fans of this winery, and carry their entry level Malbec, as well as their Bonarda, and Reserve Cabernet Sauvignon, but "Mayacaba" is the cherry on top, a single-vineyard Malbec from old vineyards in Luján de Cuyo with lots of sun-exposure, resulting in rich concentrated fruit, before aging the wine in French Oak for 20 months. Easily capable of being aged for 10 years, we're super excited to open this bottle to celebrate World Malbec Day. Though we're loathe to the term, Ernesto Catena fits the bill of wine royalty, as the eldest son of Nicolás Catena Zapata. Zapata is a phenomenal third generation grower who was instrumental in studying the terroir of Mendoza, and found that vines flourished in the Uco Valley, some 81 kilometers south of Luján de Cuyo. Ernesto uses the natural advantages of Argentina to produce an exceptional Cabernet Franc, sourced from a handful of vineyards in the Uco Valley (all around 3,600 feet in altitude) and all but certified biodynamic practices. He lets the wine age for 14 months in 80% French Oak, and 20% American Oak (70% of that is new, 30% of that is second and third use). The result is a wonderfully balanced Cabernet Franc, with notes of blueberry, well integrated tannins and the characteristic spice that is a touchstone for this varietal.